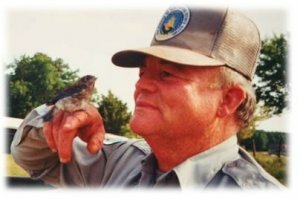 Frank Newell is a passionate advocate for the Eastern Bluebird population and for many years he's been doing his part to make the Warrenton / Lake Gaston area "the Bluebird Capital of the World". Frank is a retired wildlife specialist with the U.S. Department of Agriculture, Wildlife Services Division and a licensed state and federal Wildlife Rehabilitator. He is the founder of the Eastern Bluebird Rescue Group and the Newell Farms Wildlife Rehabilitation Center. Frank was raised on a farm in Warrenton, North Carolina, where bluebirds made their homes in abundant wooden fence posts that surrounded the small pastures. After 38 years in the military, Frank returned to the family farm. He noticed that the fenceposts were made of metal and the bluebirds were few and far between. Watching bluebirds from the front porch one day, Frank figured that they were asking him to build them a home. And so he did, again and again and again. Initially, Frank built the bluebird houses by himself. He could put together 25 houses in a week using donated lumber and a Sears table saw that gave service for 33 years. Times changed and the demand for houses increased. Volunteers began to help and donations were made by businesses and civic clubs. Lumber had to be purchased. Since 1989, when he started tracking, Frank and the volunteers of the Eastern Bluebird Rescue Group have built more than 265,000 bluebird houses which have been sold at or below cost. Another way that Frank is working toward his goal of making his area the Bluebird Capital of the World is by providing wildlife education programs to the public. Over the years Frank has conducted hundreds of wildlife programs for a variety of groups, including school groups, Boy Scouts, 4-H clubs, church groups, civic organizations, hunting groups, and many other organizations. He calibrates his presentation to the age group of the participants and teaches mostly by demonstration. Frank's knowledge of wildlife is well known in the Warrenton / Lake Gaston community and beyond. Thousands enjoy his Wildlife column which appears each week in the Warren Record and the Lake Gaston Gazette.